Scitec HCA Chitosan is an effective fat reducer, free of stimulants. The supplement contains chitosan and a high quality Garcinia Cambogia extract, standardized for hydroxycitric acid content. The product supports and accelerates the weight loss process. It is especially recommended for people who can not tolerate aggressive burners containing large amounts of stimulants. It is perfect for problems with excessive appetite, it can be helpful for lovers of a diet rich in fats and carbohydrates. Hydroxycitric acid (HCA) is a citric acid derivative obtained from tamarind fruit from Malabar (Garcinia Cambogia). After getting into the body, it is extremely biologically active and interferes with a number of biochemical processes taking place in the body. It affects, among others, the metabolism of fats and carbohydrates, reduces the intensity of inflammation, eliminates free radicals and pathogenic microorganisms from the body. Chitosan (chitosan) is an organic aminopolysaccharide. It is formed as a result of the removal of some acetyl groups from chitin (a natural component of shellfish armours). In terms of its chemical structure, it resembles hyaluronic acid. It belongs to biodegradable and non-toxic compounds, and is widely used in medicine, food industry and supplementation. Due to the high biological activity, the high value of the indicator of secondary swelling and the ability to bind fat in the gastrointestinal tract, it is ideal for slim products. The supplement uses a natural and very effective mechanism. It reduces the absorption of fat and carbohydrates, which helps to lose unnecessary fat and to accelerates slimming. The active substances in the preparation act synergistically. Hydroxycitric acid is mainly a powerful competitive inhibitor of the ATP-citrate lyase enzyme, which is a catalyst for the reactions taking place in the lipogenesis process. Blocking the activity of this enzyme results in the inhibition of fatty acid biosynthesis, but also intensifies their oxidation. This results in a reduction of lipogenesis, which takes place, for example, Chile being on a diet rich in carboydrates. Chitosan is a perfect complement to HCA. Its activity is focused on fats. It binds them in the upper part of the gastrointestinal tract, thus preventing their degradation by enzymes and absorption in the intestine. One molecule of chitosan can capture the amount of fat that exceeds its mass by about 20 times! As a result, a large amount of FAT is simply expelled from the body with faeces. The supplement has one more important advantage, which increases the effectiveness of its slimming effect - it is the suppressant of appetite. Stopping appetite in a natural way translates into a smaller number of calories taken with meals, and as you know, the caloric deficit is crucial for effective reduction of excessive body weight. Hydroxycitric acid is mainly responsible for this action. It affects the serotonin metabolism, modulates leptin concentration and reduces the production of neuropeptide Y which stimulates appetite. In this way, the work of the center of hunger and satiety is regulated, the psychological well-being is improved and desire to snack under the influence of stress or negative emotions is reduced. In turn, the chitosan is characterized by a significant value of the secondary swelling index. Many users report that after its intake, the feeling of full stomach takes place for a long time, which reduces desire to snack. The preparation also has a wide range of health-promoting properties. The substances of this product are strong antioxidants and they have also anti-inflammatory, anti-microbial, anti-cancer properties. The studies proved that both HCA and chitosan have a positive effect on the lipid profile. They favor the reduction of triglycerides and cholesterol, and thus limit the risk of cardiovascular disease. Morevoer, hydroxycitric acid may prevent diabetes and metabolic diseases. Researchers have proven that it improves carbohydrate metabolism, increases the efficiency of glucose transport into cells and reduces the degree of insulin resistance. 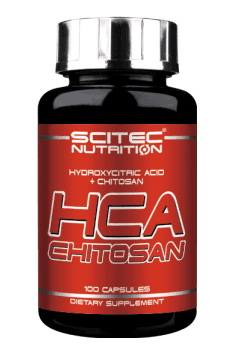 To sump up, Scitec HCA Chitosan is a supplement based on natural ingredients and it will work very well for people struggling with excessive body mass. The product does not contain any substances with a stimulating effect, which increases its safety profile and gives it a quite universal character. Take 2 times a day 2-4 capsules 30 minutes before a substantial meal. Supplement reduces the absorption of fat and affects the transformation of carbohydrates, so the best effects can be achieved by taking it before a large meal. Take a daily intake of the supplement (2 capsules) once or twice a day. Due to its mechanism of activity, it should not be used for a longer period of time because it may lead to a deficiency in fat-soluble vitamins. For this reason, after about two months of supplementation, you should take a few weeks break.